17-04-2019, 22:36 - Graphic conversion for any 256x192 into MSX1 graphics (Source code in Blitz Basic). 09-04-2019, 20:30 - Rectangle Intersection Z80 machine code implementation - any tips? 09-04-2019, 14:09 - Rectangle Intersection Z80 machine code implementation - any tips? 08-04-2019, 01:43 - Rectangle Intersection Z80 machine code implementation - any tips? 13-03-2019, 22:22 - Back to MSX after 30+ years! 01-03-2019, 19:36 - Progress in Ghost´n Globins now working at full speed on MSX2!!! 14-12-2018, 20:41 - how can i format disks? 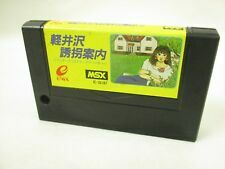 29-11-2018, 15:30 - MSX Remakes ?